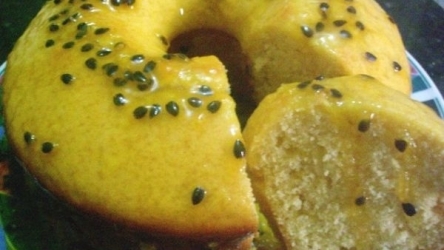 Bolo de Maracuja is a Brazilian passion fruit cake. Blend the passion fruit pulp, take the seeds out, and reserve. Beat well egg yolks, sugar, margarine then add passion fruit pulp and egg whites. Add flour spoon by spoon, mixing well with a spoon then mix in baking powder. Bake in preheated oven on medium. 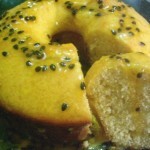 Sauce: Cook 2 cups passion fruit pulp (with seeds) and 2 cups of sugar, mixing well without boiling until syrup forms. Then pour over finished cake.